Happy new year to all the crafty people of blogland. I have been MIA for sooooo many days......no months. But I did manage to do some craft in recent days.Made a quiled picture frames and a woolen scarf for Ananya's teachers as Christmas gifts ( and forgot to take pictures........) Started quilling again and found a wonderful blog Quilling Me Softly. Pritesh ji has such great talent, I was completely bowled over by her quilled projects. I tried to make a quilled butterfly inspired by her noodle petal flower tutorial, but it didn't turn out well :( Next I am going to try beehive technique, which I also saw at her blog. Lets see how disasterous that one will be. 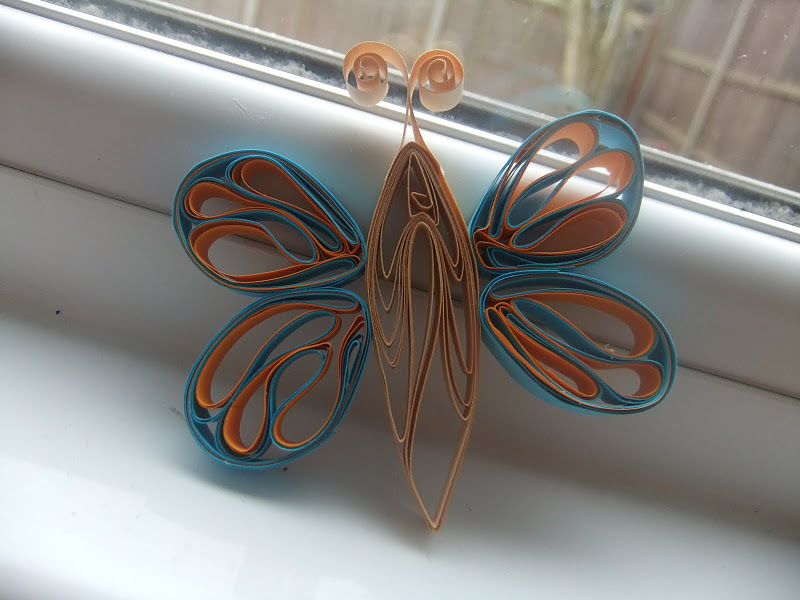 Quilling me Softly is very inspriational,your butterfly is very nice, and you'll love the BeeHive, I've seen butterflies done with that to, have fun quilling, like to see more!!! Nice try. Hope to see more from you.